Yes, Blackboard is broken, but with some mental reframing, spit, and bubblegum, anyone can smash it into a different direction. Also, who’s sick of calling this making-do business a “hack”? Let’s go back to jury-rigging or MacGuyvering. Also, your mileage on these so-called hacks may vary depending on your institution’s implementation of Blackboard. The easiest way to get Blackboard working is to give up on it. 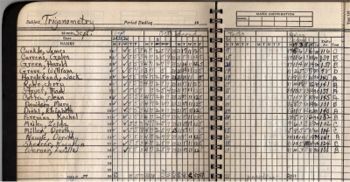 Stop trying to make it do what you want (like display a leaderboard), and instead embrace the simple principle that Blackboard is JUST A GRADEBOOK. Then, pretend Blackboard is just like an old spiral gradebook, take some sparkle glue and gel pens, and turn the darn thing into a DIY art journal (aka “smash book,” “bullet journal,” hacked composition notebook, etc.). 1. Give up on mobile. 2. Replace a custom banner with a sticky graphic announcement. 3. Jazz up the announcement banner with an embedded email link. Help students contact you quickly with an email icon or graphic in the announcement banner. Turn the graphic into a “mailto” link with Blackboard’s link function. In the link dialogue box, add mailto:yourname@youraddress.edu instead of http://whateverlink.com. 4. Link to a web-based appointment scheduler for office hours. Cut back on how often students ask, “When are your office hours again?” Use an appointment scheduling app if your school does not subscribe to Starfish or something similar. Try YouCanBookMe, which books appointments online and sends email notifications. Embed the link in the announcement banner for easy access. 5. Highlight messages, instructions, and deadlines with sketchnote style graphics. Introduce sketchnote doodles to help with memory. Use graphic organizers to structure the semester. Include visual elements from a graphic syllabus for visual consistency and easy recognition. 6. Build anticipation, curiosity, and engagement with adaptive release. Students get motivated when instructors provoke curiosity and trigger prior learning. The in-class “ah-ha!” moment is hard to reproduce online because it often occurs through experiential learning and the rhythm of freewheeling conversation, brainstorming, and the think-aloud, interactivity of “presence.” Adaptive release can somewhat duplicate these moments of discovery by exploiting a video game interactivity experience (“twitch speed“). Ask a question, have students submit the answer as an ungraded assignment or quiz, and have the submission trigger a Blackboard item with an explanation, image, or video explanation. 7. 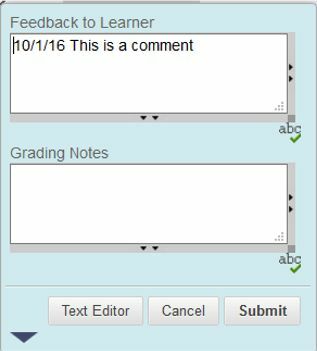 Document communication with students in the gradebook. 8. Generate impromptu speech topics with an ungraded quiz. Create a test pool of multiple choice questions. For 50 speech topics, create 50 multiple choice questions. Each question should have only one answer, but leave the answer blank. When setting up the quiz, draw the topic choices by using Blackboard’s function to select at random the number of questions from the test pool. So, for three topics, have Blackboard select three questions from the test pool. Just be sure to give students clear directions. 9. Try Google Docs for frequently used documents. Skip uploading documents from a desktop after every revision. Instead, convert frequently used handouts to Google Docs and then link them to Blackboard. Revisions update automatically to wherever the document is linked on Blackboard. This means anything used in multiple sections updates with one revision on the Google Drive, saving time and hassle. Tip: For mid-semester policy or grading changes, let students know with notations at the bottom of the page. 10. Think outside the box with assessment tools. Assessment tools are just mechanisms for getting information into Blackboard. Why limit a quiz to a quiz? Use an ungraded quiz as an informal assessment. Show a picture and ask a question prompt to arouse curiosity. Use a quiz as an adaptive release trigger to open new class notes, modules, or units. Find ways to flip classes with these tools instead of just posting links to videos. Students love to click. 11. Bonus: Explore what Blackboard DOES offer. Blackboard’s extra features such as managed views look like gobbledygook, but taking Blackboard to the next level can be worthwhile. Sometimes. Maybe. Managed gradebook views can reduce grading headaches, for example. And Blackboard’s due dates feed into its calendar, which then can feed into Google calendar. Stop treating Blackboard like an Excel file. It’s a composition book! An awesome graph paper notebook! A fantabulous database to store things. It’s only as limited as our imagination and patience. Sorta….sorta. Why employers want you to have a side gig. Really. I Moved to Rhinelander, Wisconsin! King Lear: Is This the Promised End? Gratitudes: Ten Internet Acronyms OMG!!1!! D&D Adventuring: Which other hand? Dr. Sells's "Low Tech Weekend"
Almost Nekkid - Almost 50! Toilet Paper or Cat Toy, You Decide! Where's Neil Postman When You Need Him? A Sign of the Digital Times, or a Sign of Me? Just a Link: Aimee Mullins on TED talk on "Disability"
The Kindle and "Picard's Syndrome"
Just a Link: Googol it! Gratitudes: How Do I Work This? Institutional Racism or Acts of Meanness? A Great Quote From "French Theory"
Threes: How Do I Work This? Editorial vs. Article — Can You Tell the Difference? What Does 30 Mean in Journalism? Just a Link: Weebl and Bob! Just a Link: Guilt Trip of the Day! Where are the Foreign Fighters in Iraq? Just a Link: Iron Hymen! Why Do You Have Green Eyes? "They are so poor and they are so black"
Anne Rice: Do You Know What It Means to Lose New Orleans? "Dip the Waffles in the Milk"
George Bush, Thinking of Ways to Harm Our Country? Where are All the Grrls on the Net? What is this Blogging Thing? Bill R. Ware on Editorial vs. Article — Can You Tell the Difference? Abhishek on Editorial vs. Article — Can You Tell the Difference?